A-HOTEL.com - Luxury and cheap accommodation in Liepāja, Latvia. Prices and hotel, apartment booking in Liepāja and surrounding. This indicative offer was derived from the most recently booked accommodation in Liepāja and sort by the price, from cheapest Liepāja accommodation to the most expensive hotels. To select accommodation by your preferences we recommend to choose from 73 accommodation offers in Liepāja in total. By entering the dates of your overnight stay in Liepāja and using the filter tools you can sort the best possible accommodation for you. The entered dates of your stay are crucial for the most accurate offer as it derives all the online information on pricing and availability of Liepāja accommodation. Then you can book the selected Liepāja lodging (hotels, apartments etc.) immediately. The 5-star design Promenade Hotel enjoys a unique location on a canal, next to the yacht marina and the Liepaja’s Port. It features elegant rooms with air-conditioning and plasma TV. Amrita Hotel is located in the centre of the town Liepāja, in Latvia’s Kurzeme region. The 4-star hotel offers rooms with a flat-screen TV with cable channels, a minibar and a private bathroom. Situated in Liepāja, Boutique Apartments Roze offers accommodation with free WiFi and seating area. The apartment offers a flat-screen TV and a private bathroom with free toiletries, a hair dryer and bath. Apartment is located in Liepāja, 200 metres from Liepaja Museum, 400 metres from Concert Hall 'Great Amber', as well as 700 metres from Rose Square. The apartment is 700 metres from Latvian Musicians' Walk of Fame. Housed in a building from 1899, Porins Hotels is located in the old town of Liepaja, only a 15-minute walk from the sea. It offers free private parking and rooms with free Wi-Fi. Green house is located in Liepāja, in a quiet part of the town, a very short walk from the Liepāja Lake. Free Wi-Fi access is available in this holiday home. Boutique Hotel Roze is the only hotel in Liepaja that is located in the park and seaside area. The distance to the beach is 100 metres, and it takes only 3 to 5 minutes to get to the centre of the city. Renovated in 2016, Helvita is located in the centre of Liepāja and offers rooms with free wired internet 800 metres from Liepāja Beach. It features a large garden, and free private parking. Hotel Villa Roze is situated by the seaside park in a historic area of Liepaja, about 300 metres from the Baltic Sea in a building from 1896. It offers elegant accommodation with stylish furniture. The SportHotel is located between the Baltic Sea and the Lake of Liepaja, offering rooms with free Wi-Fi, as well as 24-hour front desk service. Each room features a private bathroom with a shower, a fridge and a TV. Amber is located in the very centre of Liepāja, a 10 minute walk from the beach, and offers self-catering accommodation. Free Wi-Fi access is available. The Hotel Vilhelmine offers cosy and spacious rooms with a historic ambience in the old town of Liepaja, only a few minutes’ walk from the main tourist attractions and the beach. The hotel is located in an over 100-year-old renovated building, which is included in the Historical Heritage list of Latvia. Boasting barbecue facilities, Windrose is situated in Liepāja in the Kurzeme region, 700 metres from Saint Anne's Church. The property is close to several well-known attractions, 1. Apartment on Brivzemnieka offers accommodation in Liepāja, 300 metres from Concert Hall 'Great Amber'. 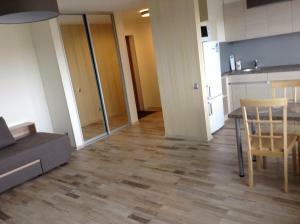 This apartment is 300 metres from Liepaja Holy Trinity Cathedral. Situated in Liepāja, 2 km from Saint Anne's Church, Apartment Siguldas 21 offers a living room with a flat-screen TV. This apartment is 2. Featuring city views, Big Amber Apartment is set in Liepāja, around 80 metres from Concert Hall 'Great Amber'. The accommodation is 500 metres from Rose Square. AmberHome is set in Liepāja. Guests staying at this apartment have access to free WiFi. Kolumbs Junior Suite, boasting a bar, is set in Liepāja, 600 metres from Saint Anne's Church and 700 metres from Peter's Market. This apartment is 1 km from Latvian Musicians' Walk of Fame and 1. Located 700 metres from Saint Anne's Church in Liepāja, Bartas apartment offers accommodation with a kitchen. The property is less than 1 km from Peter's Market.